The Bushnell offers two distinctive theaters and a variety of event spaces, perfect for hosting everything from large-scale productions, galas and grand receptions to intimate gatherings and corporate meetings. Two world-class theaters are at your service – The historic William H. Mortensen Hall (2,799 seats) and the modern Maxwell M. & Ruth R. Belding Theater (908 seats). Both are fully equipped to handle the most lavish modern touring productions and feature state-of-the-art sound, lighting and production systems. For more information about renting either theater for a ticketed performance, click here to contact us or call 860.987.6085. Learn more about renting our theaters. Exceed your guests’ expectations every time. Our innovative event planning, in-house catering by Max Catering, and can-do attitude consistently deliver special occasions your guests will remember forever. Mitzvahs, weddings and other life milestones are the centerpiece of our event business. Clients tell us time and again that there is no better location for life’s magical memories than The Bushnell. 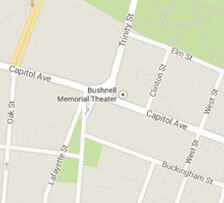 To stage your next event at The Bushnell complete our questionnaire or call (860) 987-6044. Learn more about our Special Event services and spaces. The Bushnell features a variety of spaces – from the world-class William H. Mortensen Hall, where Broadway comes to Hartford – to the intimate and refined Horace Bushnell Suite, perfect for private events. The Bushnell is Connecticut’s most elegant full-service space for performances, fund-raisers, weddings, mitzvah ceremonies, corporate and private events. View the full array of Bushnell spaces here, then let our expert planners and technical staff help you create a memorable and successful event. Two world-class theaters are at your service – The historic William H. Mortensen Hall (2,799 seats) and the modern Maxwell M. & Ruth R. Belding Theater (908 seats). Exceed your guests’ expectations every time. Our innovative event planning, top-notch production expertise, and can-do attitude consistently deliver special occasions your guests will remember forever. The Bushnell features a variety of spaces – from the world-class William H. Mortensen Hall, where Broadway comes to Hartford – to the intimate and refined Horace Bushnell Suite, perfect for private events.